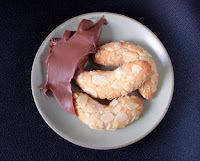 Welcome to Day #10 of Chocolate and Almond Theme Week. 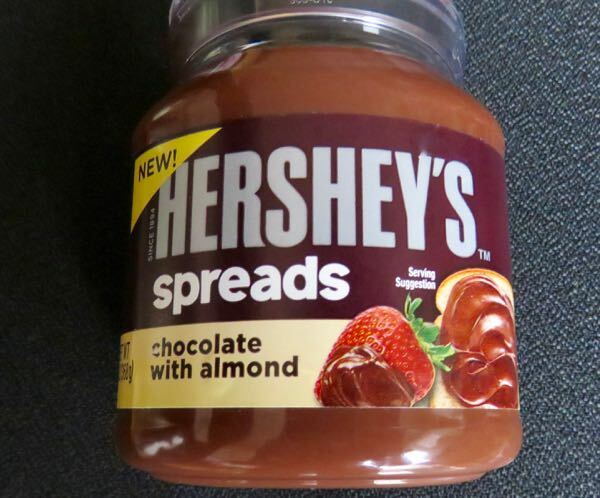 Hershey is well known for their chocolate bars, Kisses and confections, but the company has a big footprint in the candy scene and also ventures out periodically with new offerings, such as this Chocolate with Almond spread. 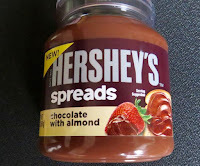 Today's spread had the look, texture (and sweetness*) of chocolate frosting, but was tastier and creamier than most frostings one can buy. I paired this spread with a few small gluten-free Aleias Almond Horns (cookies), that were also quite sweet. If one wants to bring down the sugar level, a slice of toast or a toasted muffin might be a better substrate choice.